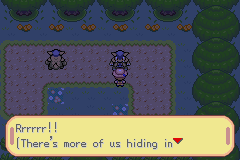 This game is based on the Pokemon Adventure Manga. The game follows the manga closely with nearly all the events inside. However, some events were changed to make it longer. 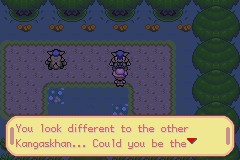 The fact that the game follows the manga closely, you don't get to chose your own starter Pokemon. However, you'll be able to get them all later in the game. Despite the game following the Manga's storyline, some events were changed or alter to make it longer. Yellow Chapter is part of the Pokemon Adventure series I am making. 2 years have passed since the horrific battle in Saffron City. Red, the champion of Kanto disappeared after the battle with a mysterious trainer. Now it's up to Yellow and Red's Pikachu to find the whereabouts of Red. Unknown to her is that the foe she's facing is more dangerous than she ever expected. Able to travel back to the past. The Past saga would bridge the game to Gold and Silver chapter by introducing Celebi time traveling (which played a huge role in the GSC chapter). In this saga, Yellow would be warped back to the past by Celebi. This saga contain several chapters and would be as big as the main saga. However, this saga can only be played after completing the Main Saga. It should be noted that this saga is non-canon. Q: Is this C067912881's game? A: Nope. We're not working together either. Q: Should I play your Yellow Version or C067912881's version? A: Just play both, it's a different game anyway. Q: You copied C067912881's game title! A: Actually, I did not. I've already came up the name for Yellow Chapter since a year ago when I was creating Red Chapter. Q: You stole C067912881's game sprite! A: Actually, I gave those sprites to him/her. Q: You stole C067912881's game idea! A: What!? How the F### did you come into that conclusion when Red Adventure, Green Adventure and Blue Adventure are made by me? Open your eyes. Q: I think you should change your game's name to avoid confusion with C067's game. A: Please don't ask me that again. Why should I change my game name when I had that idea first. Q: Do you hate C067? Why is your FAQ mostly about him? A: I don't hate him, I only hate the people who sends me pm/emails saying I stole stuff off him (e.g. Yellow Sprites) when I created those sprites. Q: Is the Ponyta chapter in the game? Q: What is the Rat Attack Bonus Chapter? A: It's a chapter where Yellow will remember how she first caught Rattata (will be able to play as young Yellow). Q: Will Red be playable? A: No. This game focuses on Yellow. Red got Pokemon Adventure Red Chapter and Pokemon Adventure FireRed Chapter to be in the spotlight. Last edited by aethestode; 10th September 2014 at 03:03 PM. I cannot wait. I'm going to be following this and the Green hack closely! Are you going to post the Blue hack any time soon? Yep, it's been posted (I'll upload the screenshots later.) I need to go to work now. looking forward to the new hack project [love how u guys don't run into problems like I do XD lol ]. Love how it has a great flow to each chapter. The story is great really don't want to read more to spoiler the hack lo.l Good luck. Nice touch on adding the crazy chapters by the way! Love it! Can't wait for Beta 1! Wow, I just noticed something. On the logo, you even put the color of the story around the word Pokémon. So much care for detail, I love that. Lol, i didn't make the logo, a fan called peetzaahhh2010 made it for me. Really nice work eh ?